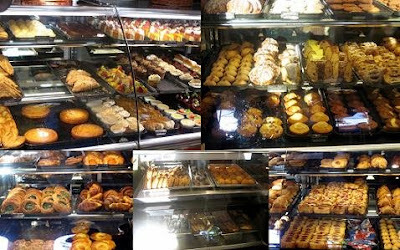 Kat's 9 Lives: Porto's Bakery : McCain VS Obama => Food Getting Political! Porto's Bakery : McCain VS Obama => Food Getting Political! 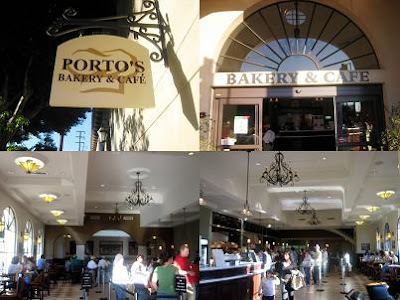 First let me start off by introducing the almighty Porto's Bakery! I have always been going to the one in Glendale, but since we were in Burbank... we had to come and try it out! I have been raving about it to Ms. Lin for the longest time but we never get a chance to make our way down there. Finally I was able to show her the joys of Porto's Bakery! It's a great deal for what you get. I prefer this over most high-end bakeries that are all show. I like my food simple and simply delicious! ^_- Of course making it pretty attracts the eye, but taste matters most of all! Porto's always had pretty and reasonably priced cakes. I was very tempted to get one and Ms. Lin wanted the Alright now for the goods! The goodies of course. I tried to take as many photos of the baked good display but there were a lot of people around so it was hard to snap the photos without some behinds getting in the way. Ms. Lin promised me a cake and I couldn't decide where to get one and she set a price limit... it's too hard to find a cake in LA for that price.. maybe a slice! lol Tiramisu because it had beautiful lady fingers lined up around it. Of course it's in the photo! ^_- Then I decided against it because I was sooooo caked out. Maybe next time. I need a cake break. My favorite cake at Porto's is the Opera Cake. I wanted to get a big cake of that but it's just a flat and unflattering cake. We both wanted something pretty despite taste. =oP So instead I picked up a slice for my tummy. Never too caked out for a tiny slice of the cake I love. Especially since their cakes are reasonably priced and sized. Not a one-bite and it's gone cake... that's for sure. They layer the chocolates perfectly with delectable cake. Since Ms. Lin is so salty! Yes, she loves salty foods. I recommended her the Ham Croquette that is just a great mixture of diced Ham and Mashed Potatoes. It's very flavorful and on the saltier side. All batter and fried. How can you go wrong with that? It's just a simple and quick snack that I like. All in all I love this bakery. I wish there was one in OC! Even if it was 20 minutes away from my house I'd go often! For those of you who know me and know how lazy I am... that's the highest compliment! lol If you live in LA or go to LA often and have not heard or tried this place you are MISSING OUT! 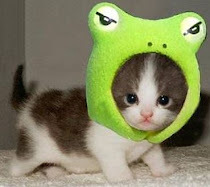 Where have you been hiding!! It's time you come out into the sun and see the world! Also my new favorite is the Caramel Kisses! Be sure to bake this so that the center will be warm before you bite in. It gives it that extra kick. They are shaped like a Hershey Kiss. Inside is filled with a Semi-Solid Caramel/Dulce de Leche. The cookie part is like a soft Sugar, Buttery, Shortbread like cookie. I am drooling just thinking about it! Apparently I forgot to take a picture of the awesome cookie and I have eaten it all already! Tough luck! ^_^ It's in one of the photos of the food case if you look closely. That's my Where's Waldo Challenge for you! Happy Hunting! I am glad I have you drooling! ^_- My goal is to spread the joy of food. Now you will have to come down and I will take both you and your sister there. Wouldn't it be great if Ms. Lin was down too? Cant wait to read your post! The good thing is the Burbank location has free parking and is less busy than the Glendale one, but of course the Glendale one holds a special place in my heart. It's Kathy from Yelp. 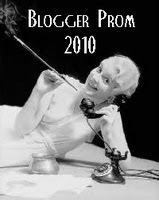 I just found your blog and I'm drooling already. 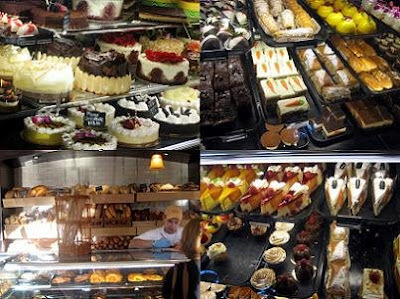 I have to try Porto's. My bro brought the most delicious Cinnamon-type coffe cake from there. I can't believe I've never gone myself! Happy Eating. Thanks for the happy hour links! Hey Kathy! Thanks for reading! You definitely should try out Porto's. Hmm maybe I need to try that Cinnamon Coffee Cake. Sounds delicious! ^_^ They have a location in Glendale by the Galleria and one in Burbank on Magnolia. No problem, I hope you enjoy Happy Hour! ^_- It was great meeting you at the event! you were in burbank and did not call me ... ? Shame, kathleen, shame on you!